Located in Stonewall, Texas, the heart of the Hill Country. As a mobile professional kitchen, we travel to your location, serving slow and low smoked, tender and mouth watering Brisket, Pork Ribs, Pulled Pork and Chicken in assorted plates, sandwiches, nachos and tacos. You usually find us at Winery's, Private Parties, Festivals, Weddings and catered Special events. 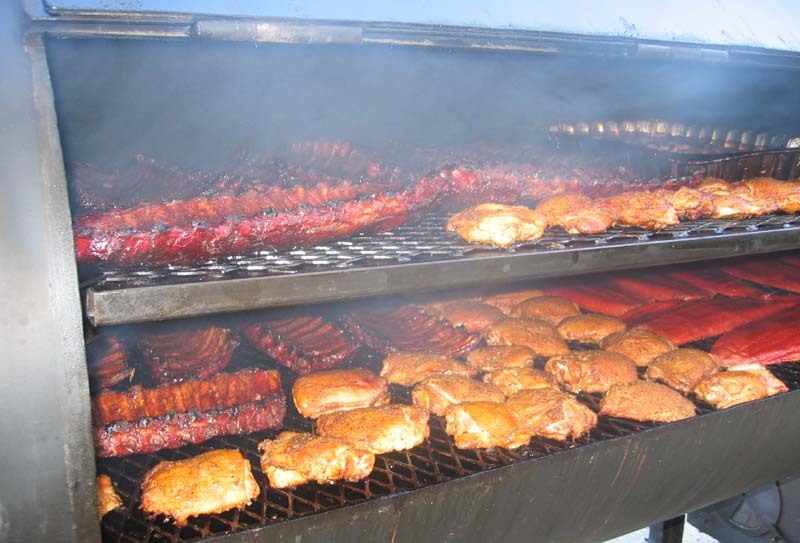 Our BBQ places are served with our succulent smoked meats, two sides, onion, pickle, and bread. Our tender smoked brisket, sliced or chopped, served on a bun with BBQ sauce. Juicy smoked pulled pork served on a bun with BBQ sauce. Cole slaw on the side. find our location and schedule for the coming months. Catering your next shindig, party, wedding or whatever is our total mission. Whether it is tiny to Texas-sized, with our catering options, we will make it happen to your satisfaction. Since we have a mobile kitchen, we can bring it right to your location to guarantee the freshness to delight your guests. We have a four foot rotisserie smoker on our trailer in addition to the professional kitchen. There is nothing better than to dig into some right of the pit Bar-B-Que, whether it is brisket, chicken, pork, ribs, sausage, or any combination thereof, along with those sides of potato salad, coleslaw and beans. We can even handle Desserts, such as an all time favorite peach cobbler. Or, if you want something fancy we can't do, we have contacts within the community that are professionals in that category. Just tell us and we will make it happen. We don't have fixed packages that you have to choose from, but we find out what you want and we make it happen. Give us a call at 830-456-5001 and lets talk.